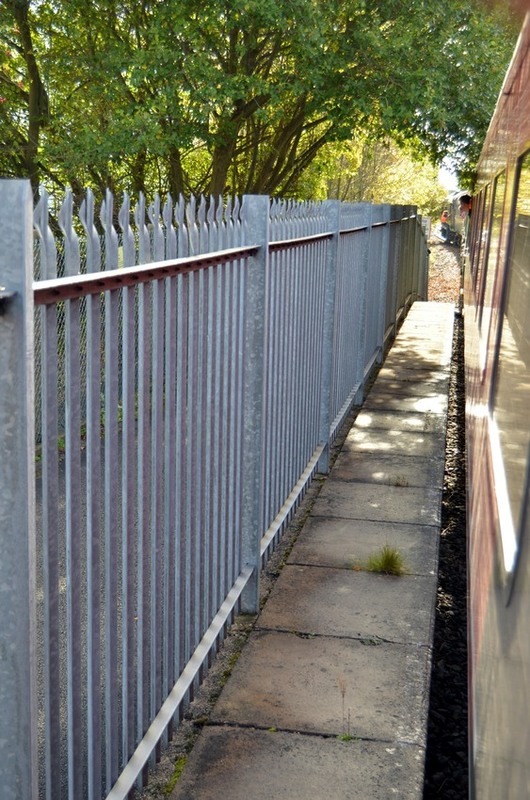 Worcester Shrub Hill, Tunnel Jn, Droitwich Spa, Bromsgrove, Barnt Green, Longbridge, Kings Norton, Lifford East Jn, Bordesley Jn, St Andrews West Jn, Landour Street Jn, Saltley PSB, Washwood Heath West Jn, Castle Bromwich Jn, Warter Orton West Jn, Water Orton, Kingsbury Jn, Tamworth, Wichnor Jn, Burton-on-Trent, Clay Mills Jn, North Stafford Jn, Stenson Jn, Derby, Derby Station North Jn, Chaddesden Curve (reverse), Derby Station North Jn, Derby. 47 848 at the end of the line at Moreton-on-Lugg after we had come to a stand. The 14th Century tower of St Margaret’s Church in Wellington is behind the engine. The night before the tour, the train was stabled alongside Derby station platforms. Rail Operations Group 37 884 was at the London end of the train. A1 Pacific 60163 Tornado was alongside on a railtour shortly before this photo was taken at around 21.30 - so 37 884 photo was taken by many as a consequence! 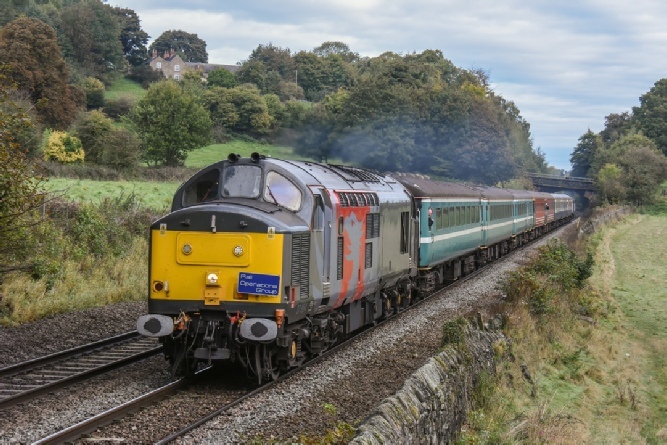 37 884 waits to leave Rowsley South towards Matlock and Derby. This engine was released from English Electric Robert Stephenson & Hawthorns in November 1963 as D6883 and first allocated to Landore. It later gained the TOPS number 37 183. It was transferred to Inverness in 1982 to replace Class 26 & 27s on the far North and Kyle Lines until displaced by Class 156 Super Sprinters and allocated back to Wales, this time at Cardiff, in 1988. 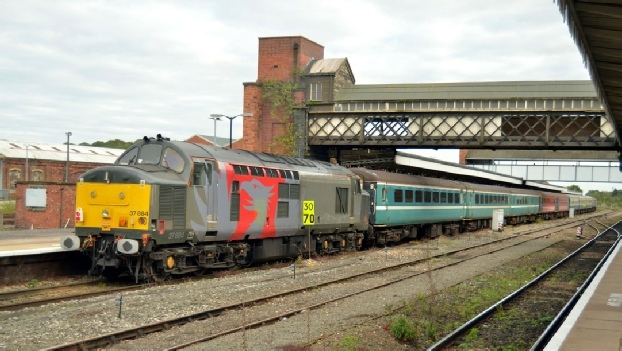 It was shortly afterwards renumbered 37 884 when its main generator was replaced with an alternator and a ballast weight added in place of the former steam heat generator to improve haulage capabilities. 47 848 after arrival at Rowsley South next to resident Class 31, 31 270 in Regional Railways colours. 47 848 entered traffic in January 1965 as D1652. It gained the TOPS number 47 068 in March 1974. Electric Train Heat was fitted in December 1985 when the engine was remumbered 47 632. A further renumbering occurred in December 1989 when the locomotive was fitted with long-range fuel tanks for Cross-Country duties. 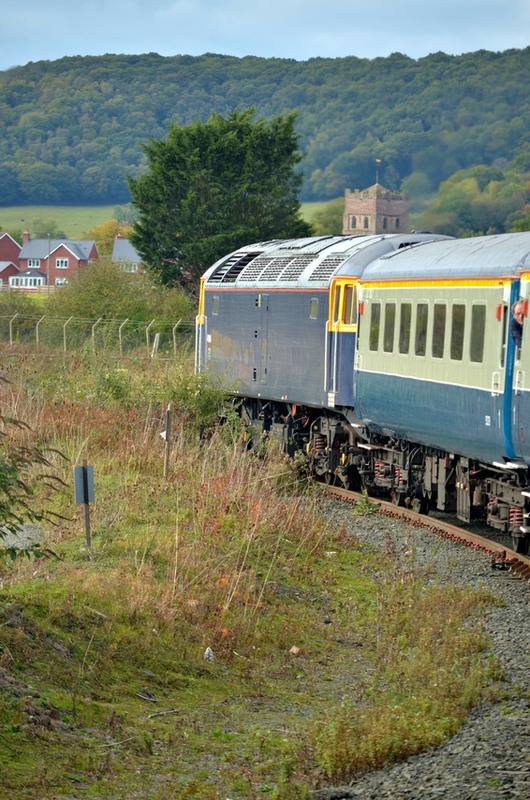 As an InterCity engine, it was painted in the INTERCITY ‘swallow’ colours before gaining Virgin colours after privatisation. 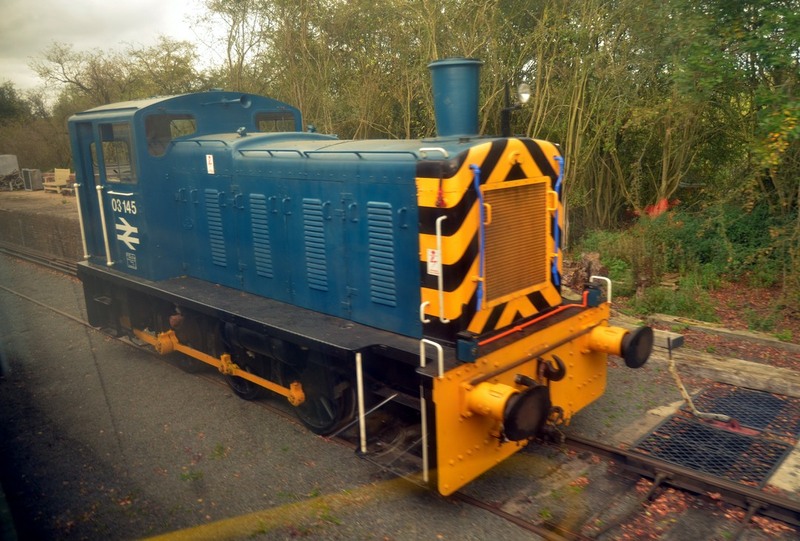 It is now painted in Riviera Train blue, which is a slightly different shade to BR ‘Monastral’ blue. 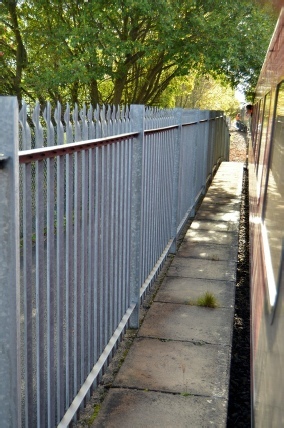 The disused platform at Sinfin Central after arrival, looking towards Derby on the left and in the direction of the former line to Ashley de la Zouch on the right. The station first closed in 1930, before being reopened by British Rail in 1976 for workers in the nearby Rolls Royce factory. Usage was disappointing, however, and there was only one train per day by 1992. Passengers wishing to travel to Sinfin were transferred by ‘railway’ taxi after the final timetabled passenger train ran on 21st May 1993 and the station was formally closed in 1998 - by then only three regular passengers used the taxi! 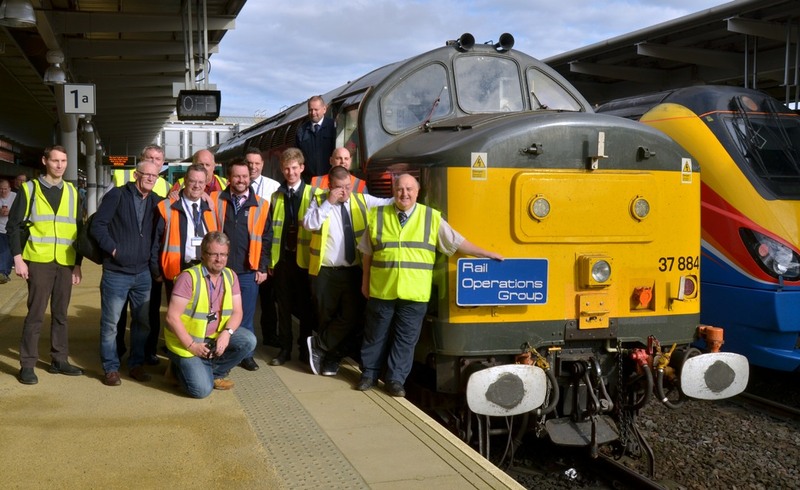 Staff and stewards from the train pose at Derby where the train revised upon arrival back from Sinfin Central. Birthday boy, Allan Spencer, next to the locomotive head board. 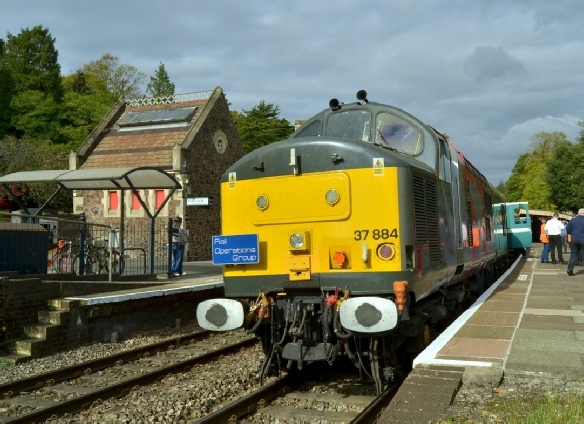 There was a short photo stop at Great Malvern station where 37 884 is seen at the front of the train. This well kept station was built by the Worcester & Hereford Railway by the architect Edmund Wallace Elmslie in 1862. Built to serve the spa town of Malvern at the foot of the Malvern Hills which grew dramatically in Victorian times due to the natural mineral water springs with reported medical benefits. 37 884 upon arrival of the Lickey Incliner II for the first time at Hereford, This locomotive had a lucky escape, being withdrawn and sold for scrap to EMR Kingsburyby EWS in 2012. 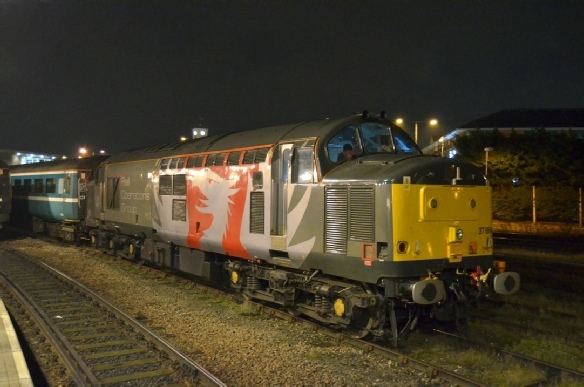 Fortunately it was brought by Europhoenix in 2013 and this locomotive is now painted in combined Europhenix / Rail Operations Group livery. This locomotive is often deployed hauling rolling, stock, especially EMUs, to and from their home depot and works for overhaul as well as being used for the delivery of new stock. 47 848 at the other end of the train at Hereford. This locomotive, whilst currently unnamed, has previously been named as “Newton Abbot Festival of Transport” in 2000 and then “TITAN STAR” in 2006. 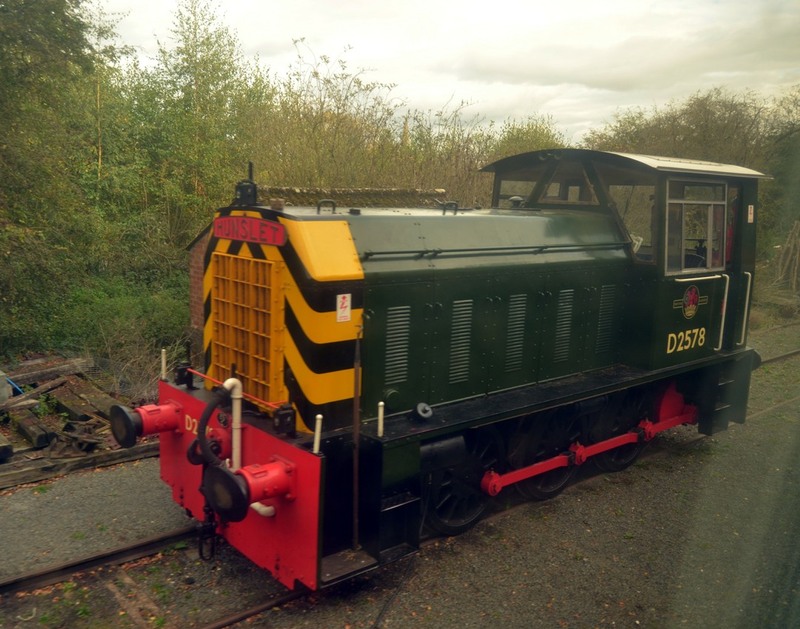 D2578 “Cider Queen” at Morton-on-Lugg. This 204hp engine was built ion 1958 by the Hunslet Engine Company of Leed. Withdrawn by British Railways in 1967, the engine was sold to Bulmers Cider until it was sold to the D2578 Locomotive Group in 2001. Whilst this locomotive never received a TOPS number, one locomotive, D2554/05001 became a Class 05 - being used by BR on the Isle of Wight, where it is now preserved. Fitted with a Gardner 8L3 engine and four speed mechanical transmission. 03 145 at Morton-on-Lugg. This Swindon built machine entered service in 1960 and survived in BR service until 1985, it spending its whole BR career in Wales. It was sold to C.F. Booth in Rotherham for scrap, but when being transferred with two other class 03s, fortunately (for 03 145), it suffered a hot axle box at Gloucester and so never got to Rotherham. 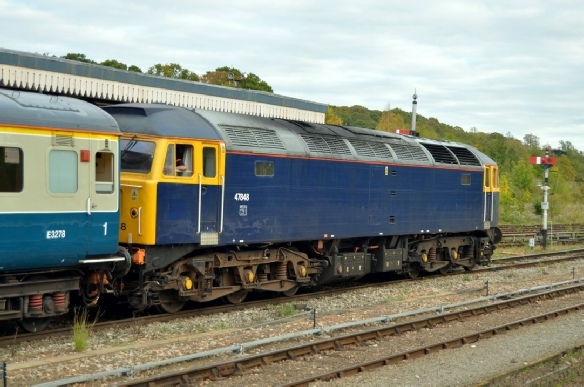 It was removed by road by another scrap dealer in 1986, but was then sold to Cotswold Rail and moved to the Fire Training Centre at Moreton- in-Marsh before further sale to the D2578 Locomotive Group in 2001. 47 848 at Worcester Shrub Hill during a 48 minute reversal and ‘tea break’ between 17.00 and 17.48. Some ten hours after departure from Derby, the tour had ran more or less to time for the whole day. 47 848 led the train from Hereford and is seen facing London / Bristol on Platform 2. Note the Western Region lower quadrant signals. 37 884 at the other end of the train, ready to depart towards Bromsgrove, Lickey Incline and Derby. The station was designed by Edward Wilson in 1865 and was originally jointly owned by Oxford, Worcester and Wolverhampton and Midland Railways. Alan’s birthday cake - ready for cutting! Alan seen, just a few years ago, at the controls of a Class 47. © Text: Stuart Smith. Photos & associated captions: Tom Chaffin unless marked otherwise. To celebrate his 70th birthday, and over 50 years working on the railway, Alan Spencer decided to run this charter train for family, friends, invited guests and former work colleagues. I was asked to take the role of Train Manager and oversee the stewarding onboard throughout the journey - a task I had no hesitation in accepting, as it would allow Alan a chance to ‘enjoy’ his day and socialise with those onboard. The train was formed of eight Mk2 carriages, provided by Riveria Trains at nearby Burton-on-Trent. 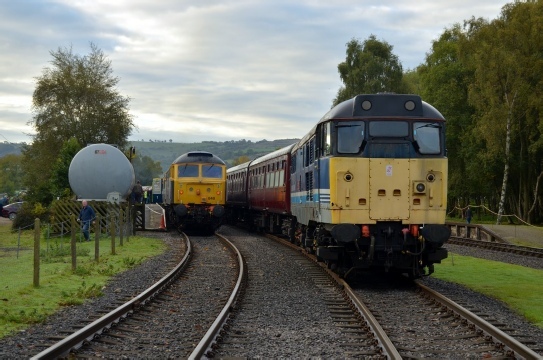 Rail Operations Group (ROG) were supplying the motive power for the entire day, with Class 37, no. 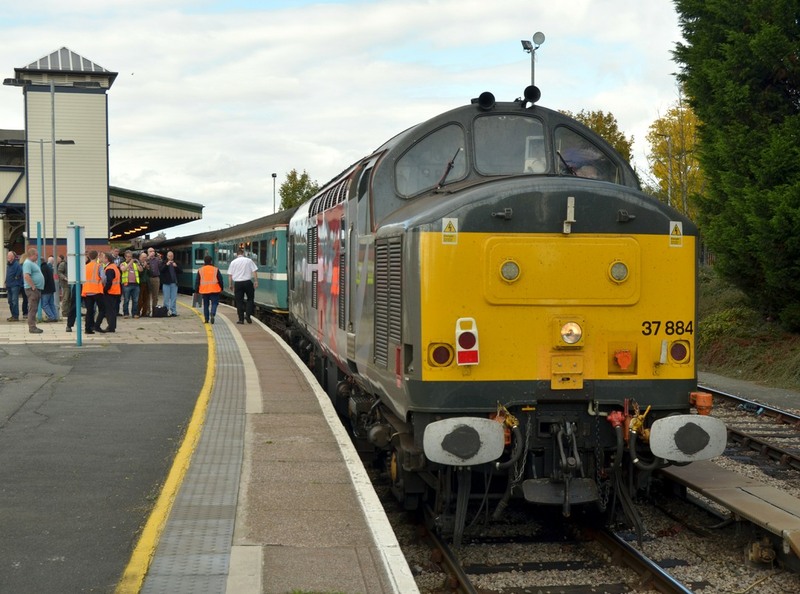 37884, and Class 47, no. 47848, operating in top n tail mode throughout. Invited guests, along with friends & family were sat in Premier Class to the north end of the train. 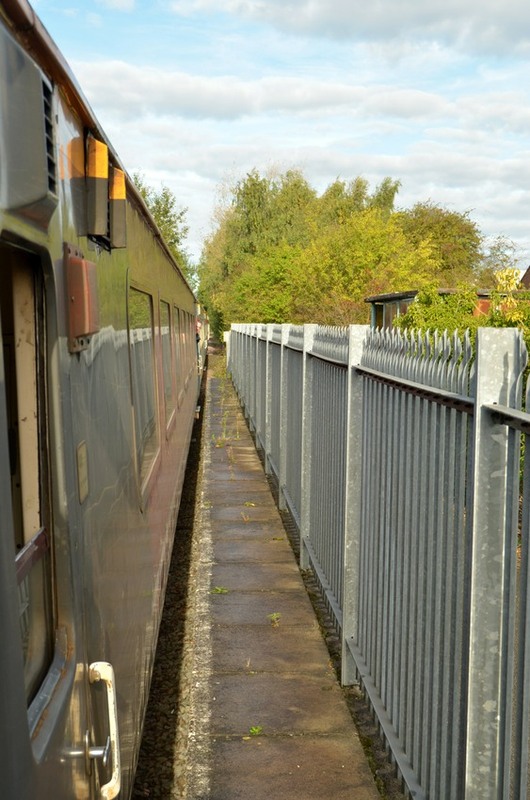 The rear of the train was made up of Standard Class vehicles, being offered for sale to members of the public, who wished to take advantage of some of the rarer aspects of the routing. The middle of the formation was a kitchen car and brake vehicle. So, with passengers settled onboard at just before 7:30 am, we headed north from Derby towards Ambergate and Matlock. A brief stop at the later enabled us to pick up a member of Peak Rail train crew for the journey through to Rowsley South. The connection between Network Rail and private infrastructure was re-aligned and re-commissioned in July 2011 to allow Peak Rail trains access into the main station (as opposed to Matlock Riverside), and allowing through excursions, such as the two running today (the other being a steam charter from Norwich hauled by Oliver Cromwell), to operate directly through to Rowsley. After a short break, with the station cafe doing a brisk trade, we retraced our path to Derby before tip-toeing our way along the very overgrown branch to Sinfin. Having long since lost its passenger service, the weekly oil train is now the sole traffic on the branch. Invited guests in Premier Class had been served breakfast by this point, with other passengers onboard making good use of the ‘Flying Dutchman’ and his tempting wares! Another reversal back in Derby saw us head south towards Birmingham, via a quick detour into Washwood Heath Yard (no.5 Siding). 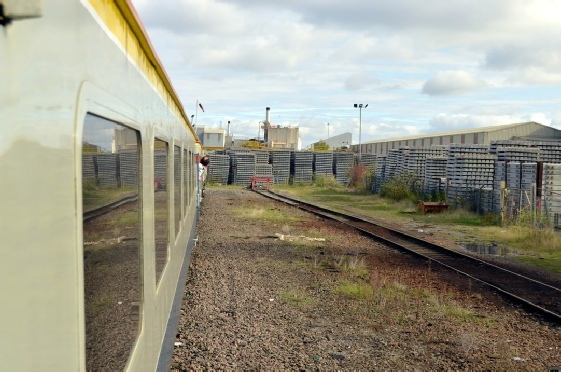 The original plan had been to visit the former Met-Cam works, now known as Heartlands Park, but this was declined in the week before the train ran due to the apparent poor condition of the track. Through Birmingham New Street without issue, and then via Stourbridge and Kidderminster to Worcester Foregate Street. 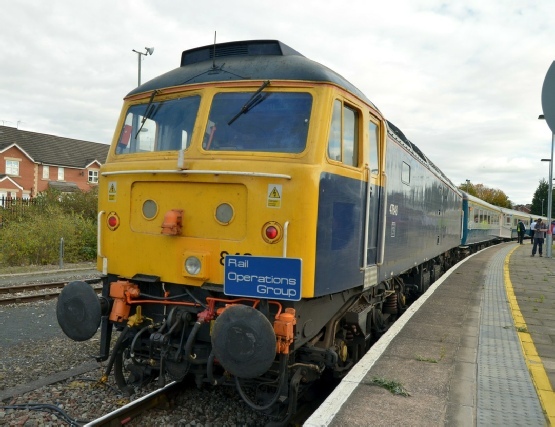 After a short stop at Hereford, the train approached Moreton-on-Lugg, and turned off the mainline to enter the Moreton Park complex - in the process, becoming the first mainline passenger train since 1971 to visit the former MOD site. 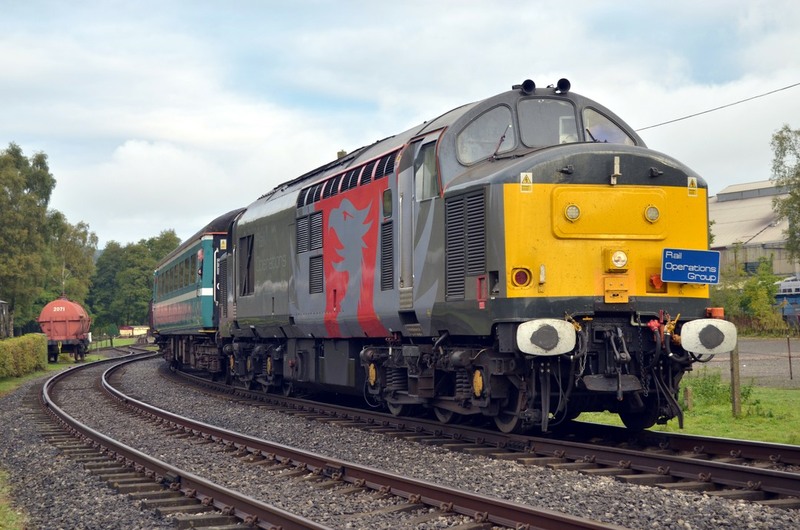 This was achieved with grateful thanks to the Neil Aitken of the D2578 group (whose three locos are based there) and Andrew Horner from Moreton Business Park. The train ran right through to the Tarmac loading sidings, which currently sends out trains to locations such as Radlett, Acton and Hayes & Harlington. 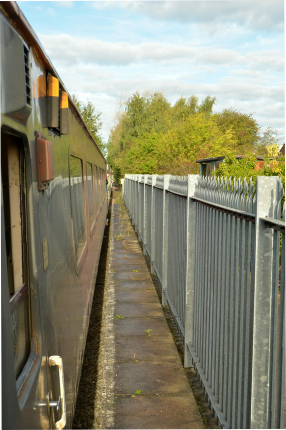 The ‘backsides on seats’ policy required during our traversal of Moreton Park gave the stewarding team a brief respite from their duties - which involved manning the beer trolleys, buffet trolleys, beer stand, performing litter collections and passenger liaison duties. All of the team rose to the challenge during the 14 hour journey to ensure our passengers had what they needed. Departing Moreton Park, a southbound Freightliner coal train was held for us (it was running early) so we could keep our path back across the single-line sections to Worcester Shrub Hill. After a short break here, we headed north via Bromsgrove and the 1 in 37 gradient of the Lickey Incline. The Class 37 locomotive on the front, made a very loud, yet steady, progress up to the summit (hauling load 8 and a dead Class 47 on the rear)! 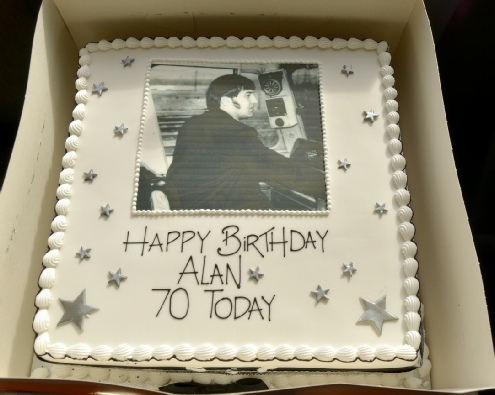 A huge birthday cake was unveiled at this point, complete with a picture of Alan in the early days of his driving career, and the entire train was invited to ‘take a slice’ in celebration. With darkness now falling, the train skirted around Birmingham and eventually made its way back to Derby (not before having a brief stop in Chaddesden Yard) to conclude a very interesting and enjoyable day. All on board had clearly had a great day (many of whom expressed this both on the train and via communications in the following days). Alan has clearly come into contact with many hundreds, if not thousands, of people during his 50 year ‘shift’, and those onboard this special train were there to celebrate their part in the story!